How Do I Perform Power and Sample Size Calculations for a One Sample t-Test? Using the One Sample t-Test, we determined that Customer Types 1 and 3 resulted in “Fail to reject H0: μ=3.5”. A failure to reject H0 does not mean that we have proven the null to be true. The question that we want to consider here is “What was the power of the test?” Restated, “What was the likelihood that given Ha: μ≠3.5 was true, we would have rejected H0 and accepted Ha?” To answer this, we will use the Power and Sample Size Calculator. 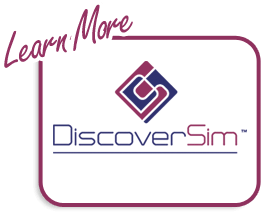 Click SigmaXL > Statistical Tools > Power and Sample Size Calculators > 1 Sample t-Test Calculator. We will only consider the statistics from Customer Type 3 here. We will treat the problem as a two sided test with Ha: Not Equal To to be consistent with the original test. Given the p-value of .012, we reject H0 and conclude that the sweetness has in fact decreased. A power value of 0.1968 is very poor. It is the probability of detecting the specified difference. Alternatively, the associated Beta risk is 1-0.1968 = 0.8032 which is the probability of failure to detect such a difference. Typically, we would like to see Power > 0.9 or Beta < 0.1. In order to detect a difference this small we would need to increase the sample size. We could also set the difference to be detected as a larger value. 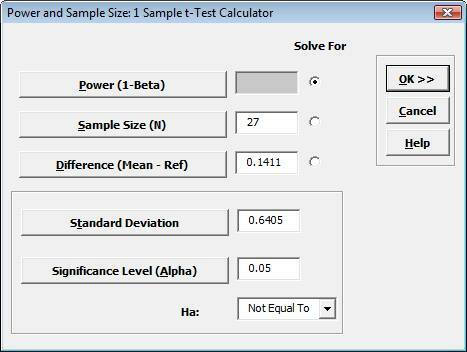 A sample size of 219 would be required to obtain a power value of 0.9. The actual power is rarely the same as the desired power due to the restriction that the sample size must be an integer. The actual power will always be greater than or equal to the desired power. 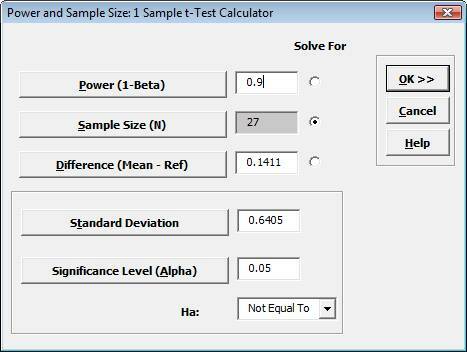 A difference of 0.415 would be required to obtain a Power value of 0.9, given the sample size of 27. 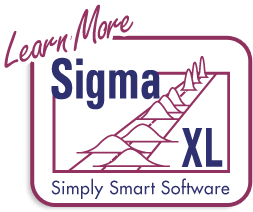 In order to provide a graphical view of the relationship between Power, Sample Size, and Difference, SigmaXL provides a tool called Power and Sample Size with Worksheets. 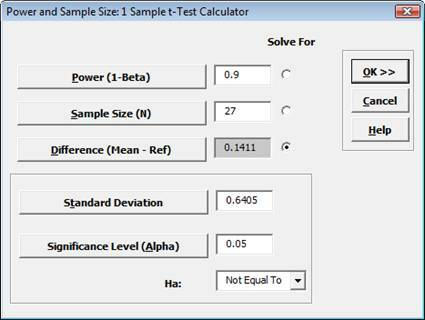 Similar to the Calculators, Power and Sample Size with Worksheets allows you to solve for Power (1 – Beta), Sample Size, or Difference (specify two, solve for the third). You must have a worksheet with Power, Sample Size, or Difference values. Other inputs such as Standard Deviation and Alpha can be included in the worksheet or manually entered. Open the file Sample Size and Difference Worksheet.xls, select the Sample Size & Diff sheet tab. 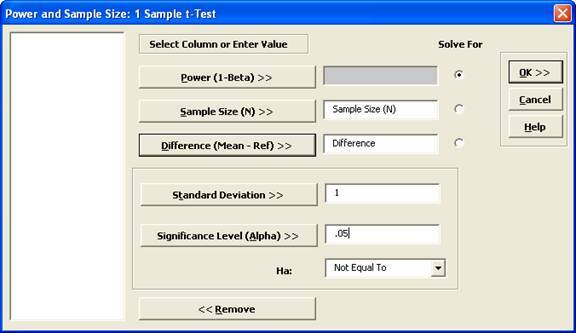 Click SigmaXL > Statistical Tools > Power & Sample Size with Worksheets > 1 Sample t-Test. If necessary, check Use Entire Data Table. Click Next. 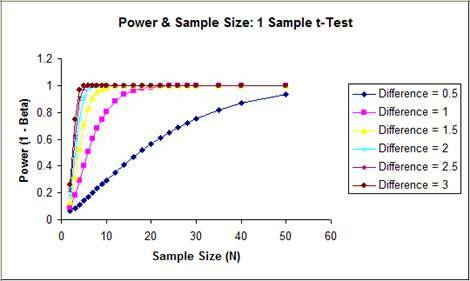 To create a graph showing the relationship between Power, Sample Size and Difference, click SigmaXL > Statistical Tools > Power & Sample Size Chart. Check Use Entire Data Table. Click Next.